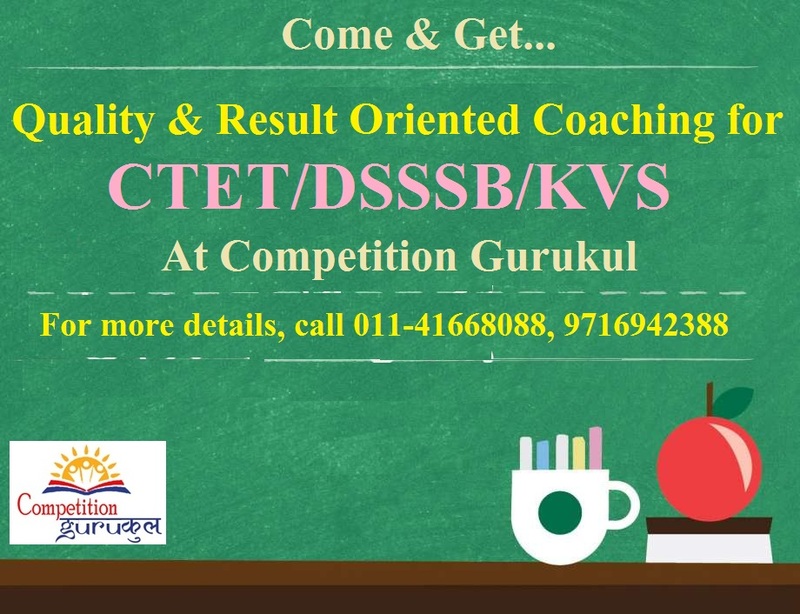 Competition Gurukul has brought a unique coaching program for CTET/DSSSB/KVS aspirants that provide them perfect preparation for the proposed exams which are to be held in 2016-17. You can consider this coaching program as a simple and straight solution for making yourselves succeed in the above exams. We provide you all those necessary resources and stuff that are needed to make you succeed. Our team ? it may be teaching faculty or non teaching, they all are capable to engage with you to achieve great heights for you. Our study material is prepared as per latest syllabus and exam pattern which if you study can lead you to solve the questions of the above mentioned exams with positive results. Our doubt and concept clearance session let you to cover various concepts and topics in a very short time. So, don't wait. Call us today at?011-41668088, 9716942388?for admission in coaching program of CTET/DSSSB/KVS or meet our counsellors at the given address--?A-38, 39, 40, Opposite Metro Pillar no: 641, Uttam Nagar, Near Uttam Nagar East Metro Station, New Delhi - 110059.